HP 3Par Upgrade Part 3 – Upgrade Day! Good times, upgrade completed successfully at the end of last week! We were planning to go to 3.1.2 MU3 but when HP got in touch with me on the day of the upgrade they advised 3.1.2 MU5 was available for our system, the requirements and pre-upgrade checks would be identical. MU5 also contains all previous patches and so there would be no need to run the individual patches we were planning. I asked what happened to MU4 as a number seemed to have been skipped in the sequence and found out that this version had been released specifically for an individual customer. HP were due to perform the actual upgrade. About an hour before the upgrade was due to begin I completed the following pre-upgrade steps and checks. I connected with the HP representative, who was very helpful via a virtual room. From HP’s FTP site he downloaded the update for the Service Processor and Inform OS. Next he disabled alerting in the Service Processor and chose to run the Service Processor update ISO. This stage was completed quite quickly and next he moved onto loading the Inform OS to the Service Processor. The Inform OS update had already been loaded to the Service Processor so the next stage was to stage the new code to the controllers. This was achieved by connecting through SSH to the Service Processor and running a bunch of commands to transfer the files. When the upgrade was kicked off I took a handful of screenshots to show roughly what happens. 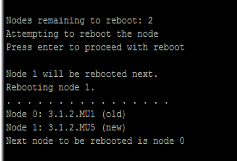 There is then a pause between reboots of the nodes during which HP will allow you to check all looks OK. I checked our alerting software, checked all VM’s were still online and ran a showhost –pathsum to check that all paths and accessibility to nodes was OK. Before the last node reboots HP are able to roll the upgrade back in an online manner, once the last node has been upgraded this must be done offline. All looked good in my case so I let the upgrade continue. 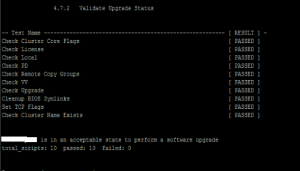 Next it was time to upgrade the firmware of the cages, this was kicked off with the command starttask upgradecage –a. To check the task was running the following commands were run: showtask –active and then we were able to drill down for more details by running showtask –d taskID. Progress was also monitored by running showcage. In the screenshot below you can see that about half the cages were done at this stage with half on 320f and half on 320c (you can see this in the RevA and RevB column). Once the cage firmware upgrade is completed it’s time to upgrade the firmware of the disks. Showpd –failed –degraded, those disks that require a firmware upgrade will show as degraded. To kick off the disk firmware upgrade run admithw. Progress can again be monitored though showtask and re-running Showpd –failed –degraded. To do all the disks and cages in our 7 cage system took about 1.5 hours. 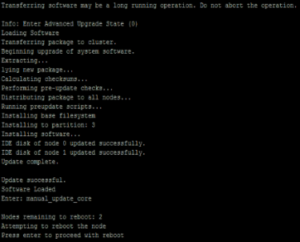 Updated software – CLI and management console. This was again downloaded from HP’s FTP site and was a simple case of just clicking next through the install wizard. That was it all done with zero down time or issues. For my first 3Par upgrade I was very pleased with how it had all run. 1 Check compatibility of components – This is to ensure that you are running a tested configuration of components that have been proven to work together by HP. There are 2 ways to go about this. Firstly you can use SPOCK. This site contains all the compatibility information you will need to complete your own checks. Or you can complete a host worksheet and return it to HP who will then verify the compatibility of all your components and firmware versions. The components you need to check are fairly standard to any SAN upgrade – Server OS, multipath software, HBA’s and fabric switch firmware versions. It is essentially a PowerShell that changes the registry value to 0 for HKLMSystemCurrentControlSetEnumSCSI<device><instance>DeviceParametersPartmgr. The value is responsible for the state of HP 3PAR LUNs following an array firmware upgrade and a 0 indicates they stay online. I got our PowerShell guy to look into if there was a way to the script against all hosts remotely but didn’t have much luck with this. It’s something I will have to look into for future upgrades, but on this occasion I had to log into each host individually and run the script.